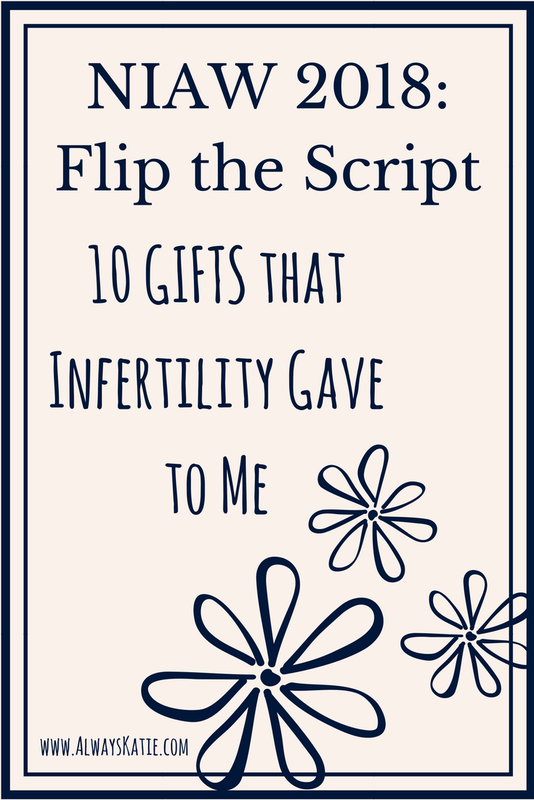 This past week has been National Infertility Awareness Week - NIAW - and Resolve has asked bloggers to write on the theme "Flip the Script." As I thought about the innumerable ways of interpreting that phrase, I decided to write about an infertility topic that doesn't seem to make sense. Infertility is a monster. It steals so much from couples who experience it. That much is indisputable. But what if I talked about the gifts my infertility gave me? First and always foremost, our infertility battle gave us our twins. Abbie and Sam are our beautiful gifts at the end of a five-year struggle, and every single shot, every single appointment, every single night spent sobbing... were worth it when we hold our precious children. Had we not had to do IVF, those specific sperms would not have met those specific eggs (no pressure, embryologists...), and Abbie and Sam would not be the incredible people we have come to love so fiercely. Huge struggles - like infertility is - can make or break a marriage. Thankfully, it strengthened Ethan's and my teamwork skills, and taught us how to work together to face down a monster that felt bigger than either of us. We learned how to be strong when our spouse is weak, and how to hold each other up when neither felt like we could walk another step of this journey. Similarly to marriage, infertility can make or break a person's faith. I learned to trust in a plan I couldn't see, and to trust that the Lord was leading me to something wonderful. I still firmly believe that He saw us through our struggle, and that our children - while the products of a lot of hard work from a lot of incredible experts - are a gift from Him. I love our testimony, and I love to share what a wonderful work God has done in our family. The online infertility community is warm and supportive, and I have made lifelong friends through this blog and through Instagram. In fact, my best friend found me when I mentioned infertility in a guest post for a fellow diabetes blogger that she and I both follow. It's so cool to have a community of people who understand and validate the struggle and the darker feelings that come along with an infertility battle. People find my blog often when searching for info about the fertility clinic we used, and they reach out to me. I love sharing my experience with BFC one-on-one, and for the last couple years, I've also been offering to add these ladies to a private Facebook group I administrate (extremely high privacy settings, so it can't be found in search, and their friends can't see that they're in it, unless the friend is also in it). There are almost 100 women in the group now, and they support each other and love on each other, and it makes me feel like I'm making a difference in the world. The feasibility - and AWESOMENESS - of pursuing IVF overseas has become a platform for me, and again, a vehicle that has introduced me to some lifelong friends. It's so true that everybody you meet is facing some sort of battle you know nothing about. Watching so many infertility stories unfold - including ours - has taught me that people handle the stresses in all kinds of different ways. Seeing unkind behavior in strangers or acquaintances now makes me wonder what private pain has precipitated that behavior, and that pause allows me to show more grace to them than I may have in the past. I MAY have had twins on my own if we hadn't had to do fertility treatments. I mean, spontaneous twins are totally a thing. But I definitely increased my chances by having two healthy embryos transferred. :-) I had heard about support clubs for moms of multiples, and I knew there was a local one because Ethan's boss at the time was a member. So I looked it up online and joined. It is so wonderful to get out of the house once a month and meet up for fellowship and programming with dozens of other moms who are either where I've been or where I will be soon. They're a great resource for twin parenting advice, for venting, and for a good laugh. I'm really thankful for the support and information I've found there! We have been through some tough stuff, and done things I almost can't fathom. And we came out stronger on the other side. We both remind each other of this whenever we are feeling daunted by something in front of us. We now have a solid track record of winning when we feel like we never will, and this has changed the way we see ourselves. We're winners. We're overcomers. We are smart and strong and tenacious. Had we not needed to do IVF, I think our dreams of world travel would have been put on hold while our kids were young. We probably never would have spent more than a cruise's port of call in Barbados. I would never have met the clinic staff who became more than a medical team, I wouldn't have fallen in love with the warmth and humor of the Bajan people, or the sparkling waters that make my breath catch even in photographs. I wouldn't have a beautiful island calling to me all the time, and I wouldn't be planning a return trip to show my kids this unique part of their story. While I wouldn't wish the pain of an infertility battle on anybody, I also can't bring myself to wish away our own. Without that pain, I wouldn't have found these wonderful gifts, and my life would probably not be as rich or full. PS: You can read last year's NIAW post here: NIAW 2017 - Listen Up! When we go to Barbados this June, it will be the first time our kids have ever been on an airplane. Because they'll be a few days past their third birthday, and are generally very well-behaved, we're optimistic that with adequate preparation and strategic packing, they will enjoy their first flights. It will be a good chance to teach them to be responsible for their own gear. It will hopefully reduce bickering over what item belongs to whom. Each paid ticket gets two carry-on items, and we may as well maximize that as best we can. Their Daddy and I will have enough to carry on our own. Now, three-year-olds aren't very big, so we don't plan to load down these carry-ons too much. We're going to be very strategic in what we pack. We're going for quality items over quantity - items that will hold attention for a long period, rather than many things that will each only entertain them for a few minutes each. IPad - Okay, my first item is cheating a little bit. 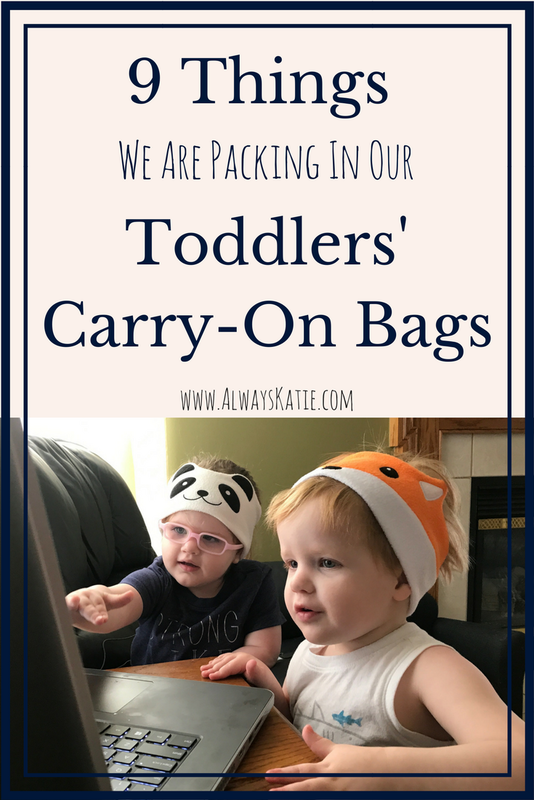 I'm not brave enough to trust a three-year-old to carry my iPad, so hubby and I will each be packing our own with the intent of letting the kids use them for games and movies. CozyPhones - We LOVE these!! I suspected that normal headphones would not go over well with my duo, but these soft, adorable fleece headphones are a huge hit here! Thankfully, the earphone parts and cord can be removed so that the bands can be washed (because... toddlers! 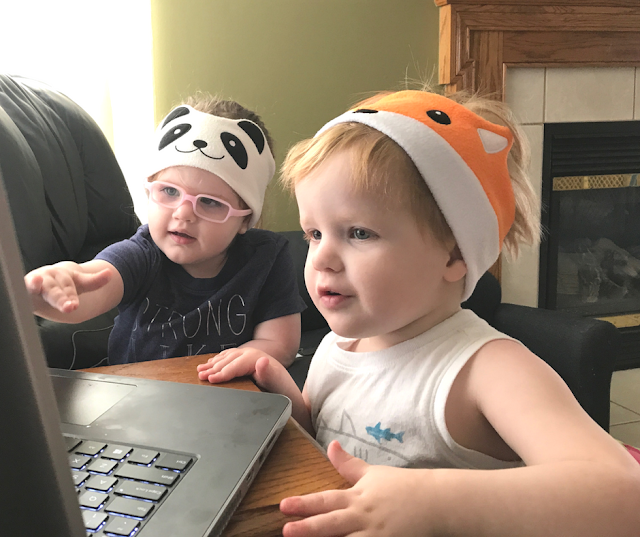 ), but also so my kids can wear their beloved fox and panda around the house without trailing cords! As far as I can tell, the sound is great quality and clear, and my super-picky and stubborn children are more than happy to leave them on! I'm sure everybody in the airports and on the planes will appreciate not having to listen to Word Party and Secret Life of Pets on repeat. I know I will. ;-) I'm so impressed with the construction and softness, a set of grown-up CozyPhones is going on my birthday list! I can't keep normal buds in my ears for ANYthing! iSpy books - My kids really enjoy expanding their vocabularies. These books are great for that, even if they don't quite get the riddles yet, and talking about the pictures keeps them both entertained for a long time. Plus, they learn! Fruity snacks - These are a special treat that the kids don't get to have often, so they will be excited when they come out at take-off time. We hope that chewing on these gummy treats will help keep their ears from hurting while we take off. Cereal necklaces - I plan on making up a bunch of these before we leave. Some for the car ride, for the airplane, maybe just for around the island. I'll put a few in their carry-ons for the first leg of the trip, and save the rest in my luggage for the return trip. Diapers - They're not potty-trained yet, and we're not going to push it. I'd rather bring diapers than be frustrated by a regression caused by a change of situation. Wipes - To use with the diapers, for meal clean up, or for any of the 8,9q3,705 other things they come in handy for when taking care of toddlers! Change of clothes - A fresh shirt and pair of shorts packed into a quart-sized zip-top baggie. In case of a messy accident or lost luggage. Have you traveled with toddlers? What are some of your must-haves? Our list won't leave a ton of empty room in their bags, but we may be able to squeeze in another thing or two if you clue us in on something we're totally forgetting!